"There was probably 100+ feet of the vine with maybe thousands of the moths. Spectacular." Florida, the Caribbean, and Texas south to Paraguay. Strays to Arizona, Oklahoma, Arkansas, Kansas plus southern Illinois in 2007! In Texas, it occurs primarily in the south and along the coast where it can be abundant. Chris Durden reported (2003) this species as having been common in Austin in October on two years in the past 35 years. 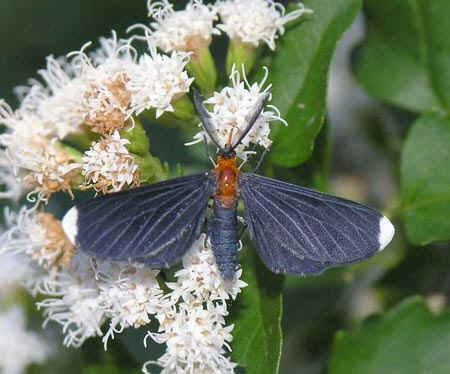 Roy O. Kendall collected a long series of this moth in Bexar County (San Antonio) in 1971 and 1981. Roy's specimens are curated in the TAMUIC. 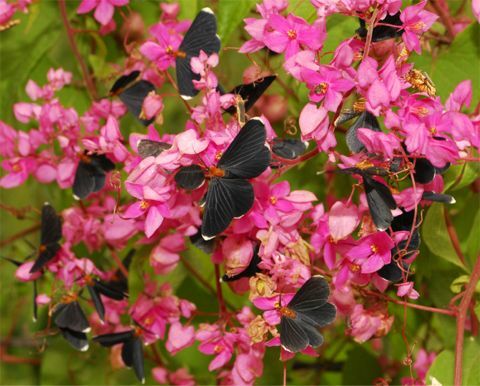 In 2007, JoAnn Merritt found a White-tipped Black moth in Midland, Midland County, TX. Two more later found that year. John Fisher identified 19 Oklahoma new county records for the White-tipped Black in 2007, but only one prior OK record dated 5-xii-1989 from Chickasha, Grady Co., OK.
Bob Barber reported an individual in far north to NW Arkansas in 2004. Several others were reported in 2007. Joel M. Johnson even lists this species for Utah (!) on his 2003 Survey of Utah Moth Species. Cliff Ferris collected a WTB in Ash Canyon, 5170', Huachuca Mountains, Cochise County, Arizona - 12 Oct., 2007. Melanchroia chephise [ MONA 6616 ] Moths of SE Arizona - Geometridae. This is apparently the first report for Arizona. Todd Wiley photographed a WTB in Randolph County, Illinois on October 31, 2007. This is apparently the first report for Illinois. Barbara Campbell photographed a WTB in Garden City, Finney County, Kansas on 30 September 2007. This is apparently the first report for Kansas. Flight Period: Texas records primarily from September through December. Melanchroia geometroides - has strayed several times to Key West, FL, ranges s. to Brazil. White-rayed Pixie - Melanis cephise (Ménétriés, 1855) ranging from Mexico to Costa Rica. Many authoritative websites use Melanochroia (with two o's) but this discussion of the genus (attributed to Parsons et al. (1999)) on the British Museum website makes no mention of this synonym. Parsons et al. (1999) included 7 species in the genus MELANCHROIA. Cramer. 1782. Pap. Exot. 4: 182. Kimball, C.P. 1965. The Lepidoptera of Florida: an annotated checklist: In Arthropods of Florida and Neighboring Land Areas. Vol. 1. Florida Dept. of Agriculture, Gainesville. 363 pp. Parsons, M.S., et al., 1999. in M.J. Scoble (ed.) Geometrid Moths of the World: A Catalogue. Volumes 1 & 2: 1016 pp. + index 129 pp. CSIRO Publishing, Collingwood, Victoria, Australia.